The continuity between these three distinct bodies of work lies in a way of thinking about possibilities and moving beyond given boundaries. During the height of Soviet Union, Vladimir worked on large-scale mosaic murals, decorating factories and community centers with state-mandated social realism compositions. In private, he sketched and later painted images considered subversive by the state. During Perestroika, he was finally able to show his private work in the public sphere, to the great appreciation of international audiences eager for a peek behind the curtain. Vladimir’s careful attention to formal elements influenced both Natasha’s and Anya’s work, yet each develops those elements in individual ways. The medium of clay offers Natasha the possibility of harnessing a moment while simultaneously referencing a deeper scale of time, indicating a geological approach to narrative and visual storytelling. The ceramic body is at once a relic, a model of a notable yet unknown figure, and a projection of a desired state. The Escapists offer a glimpse into an internal world deeply connected to, yet in conflict with, external surroundings. Anya’s work takes the pursuit of desired states to a level of wearability, where pieces made to enclose, restrain and extend the body propel participants to employ their sensory abilities. These sculptures activate a journey of self-exploration and interaction with others by stimulating bodily awareness, extending and modifying the limits of the human figure. Perestroika*: (in the former Soviet Union) the policy or practice of restructuring or reforming the economic and political system. First proposed by Leonid Brezhnev in 1979 and actively promoted by Mikhail Gorbachev, perestroika originally referred to increased automation and labor efficiency, but came to entail greater awareness of economic markets and the ending of central planning. Vladimir Dikarev explores figurative and surreal themes, combining vibrant colors and forms with philosophical perspectives. Navigating the realm between the natural and manmade, his paintings and drawings are saturated with symbolism from his native Ukraine as well as contemporary America. A cultural history of state censorship shaped an enigmatic visual code, embedded in every inch of the canvas and paper. 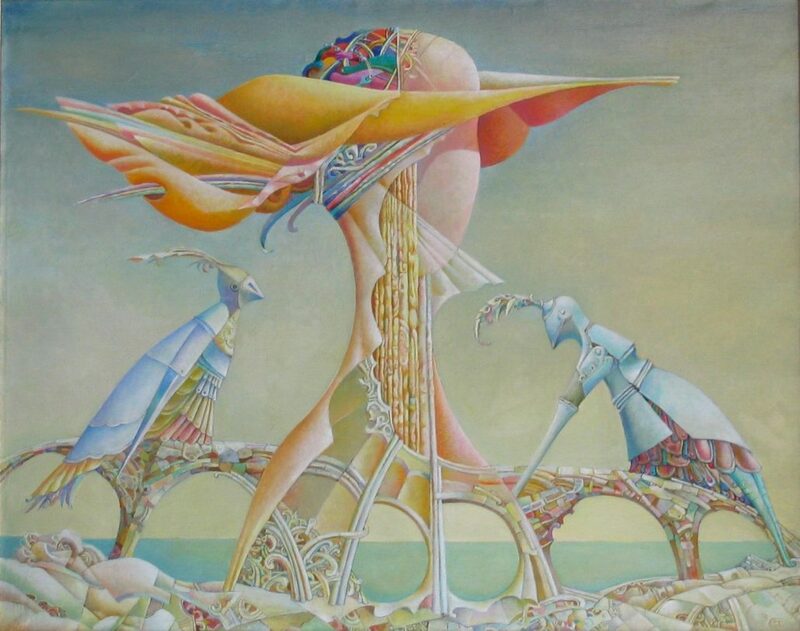 In 1968 he received his college diploma in monumental arts with highest honors from Uzhgorod College of Fine Arts. At age 20, Vladimir began his profession as a monumental artist, producing work commissioned by the state – murals, stained glass and mosaics. 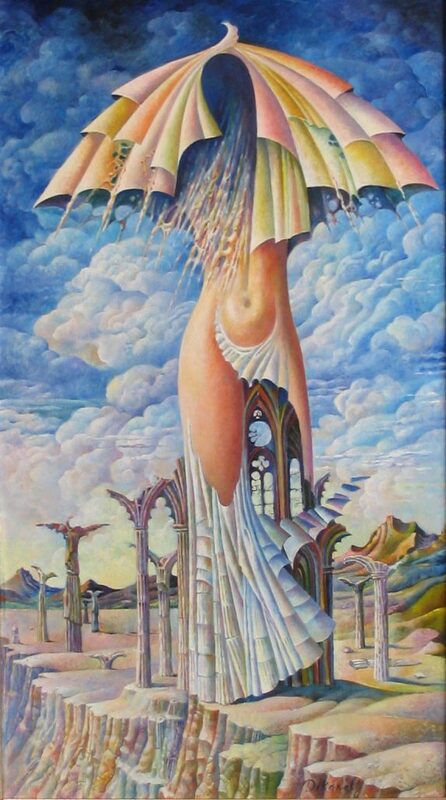 At the same time, Vladimir was privately creating his own surrealistic drawings and paintings. Public exhibition of those pieces was not possible because of state censorship issues. With the arrival of Perestroika, the whole artistic world of Ukraine dramatically changed and finally it was legal to show his private works. From 1988 on, Vladimir Dikarev has actively been exhibiting throughout Europe and the US. 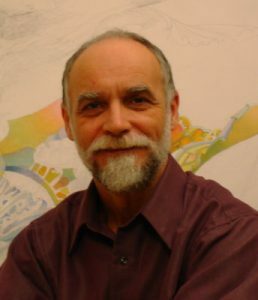 He currently lives and works in St. Paul, Minnesota. 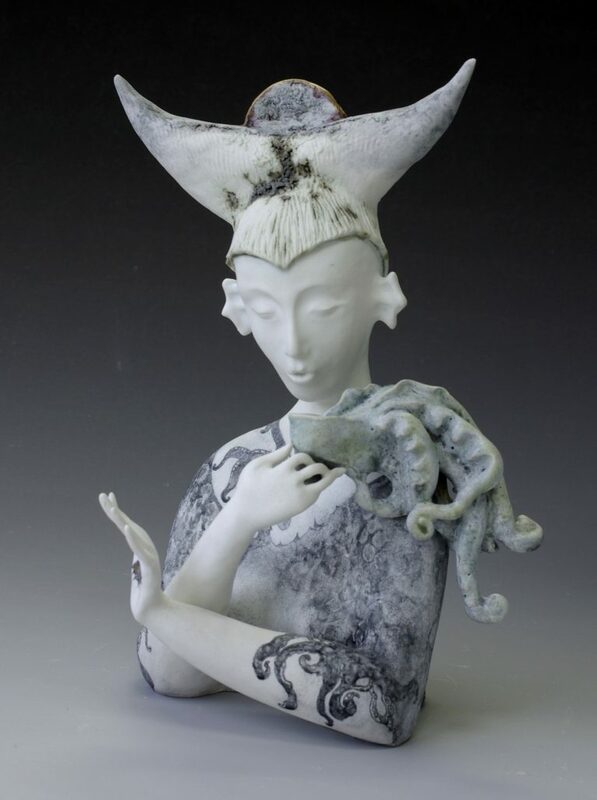 Natasha Dikareva’s ceramic sculptures explore interconnections between biological systems, mythology and contemporary technology. Drawing on her Eastern European background, her work bridges cultural and linguistic barriers, responding to a common urge to escape noisy reality and submerge in imaginative contemplation. 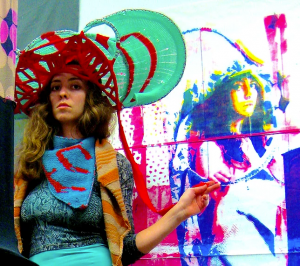 She received her BFA in graphics and drawing from the Saint Petersburg Stieglitz State Academy of Art and Design and her MFA in ceramics from the University of Minnesota. Born and raised in Kiev, Ukraine, Natasha Dikareva now lives and works in San Francisco. 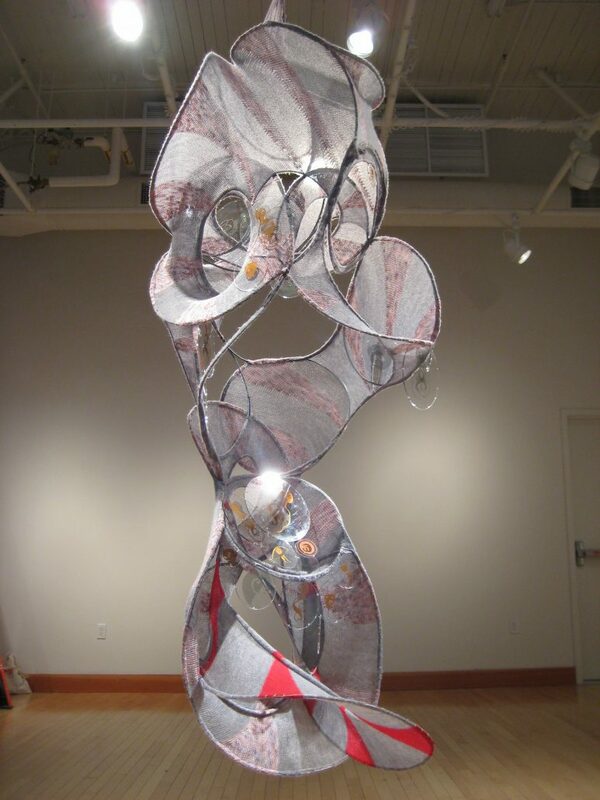 She won the Grand Prize at the American Museum of Ceramic Art in 2012. 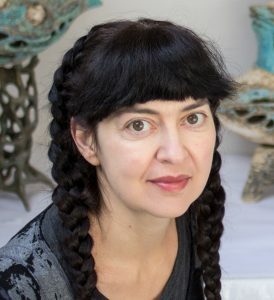 Her work is featured in various publications, including 500 Prints on Clay and New Ceramics European magazine, and is held in public and private collections. She exhibits locally and internationally. Anya Dikareva’s wearable sculptures, prints and immersive installations draw upon Eastern European folklore and contemporary science fiction. She develops symbolic narratives through costumes and objects, translating them through various media, simulating a linguistic transmission of folktales and myths. A Fulbright research project took her to Slovakia in 2012, where she studied Slavic folklore and printmaking. She holds a BFA from University of Minnesota and an MFA from University of Oregon. Anya Dikareva lives and works in Los Angeles, exhibiting locally and working on films as production designer.